To make the rub, combine 1 bunch scallions, 1 large onion, 2 tablespoons shredded ginger, 2 garlic cloves, 1 bunch of thyme, peppers, brown sugar, allspice, nutmeg, cinnamon, 2 teaspoons olive oil and juice from 2 limes into a food processor and blend. Season the chicken with salt. Pour rub over chicken and marinate for 24 hours. Grill chicken low and slow until the juices run clear when pierced. Lightly brush chicken with honey. Let chicken cook for an additional 5 minutes or until done. 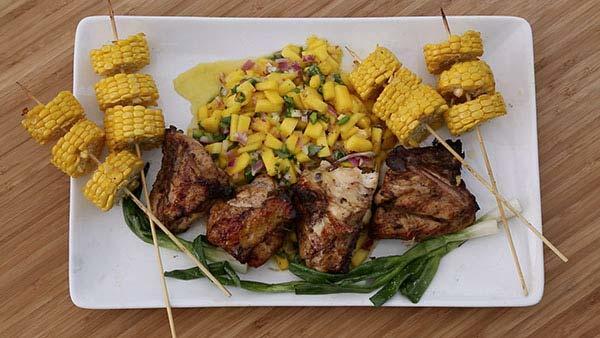 To make the mango salsa, combine mangoes, red onion diced, jalapenos, 2 cloves minced garlic, basil leaves, 1 teaspoon sea salt, black pepper, sugar, juice of 2 limes and 1 tablespoon olive oil. Refrigerate in a bowl and let sit for an hour before serving. To make grilled corn, slice the finger size ginger in half and grill over high heat until fragrant. Combine butter, 1 bunch of thyme, juice of 1 lime, 1 teaspoon of salt, pinch of black pepper in sauce pan. Heat over low flame until butter is hot. Keep butter warm until corn is ready. Rub corn with olive oil for 15 minutes. Strain butter and pour over corn. To make scallions, salt scallions to taste. Drizzle with 1 tablespoon of olive oil. Grill until wilted.